Whether you’re looking for a quick way to go from the office to the office party or the perfect style to wear to your family gatherings, the updo is one hair creation that never gets old. This year the trends seem to be soft and alluring braids, buns and bows and we’ve got the updo with Salon Sora spirt! Get ready to get your ends curled with this week’s blog! Bows, barrettes, and bling! Bows in your hair can be both romantic and youthful. This year we see a lot of ponytails wrapped in big bows to dress up any black gown or pantsuit. If you’re looking to use barrettes, use hair jewelry with lots of gemstones and silver or gold to show off your sparkle. It appears that these techniques are capping off the style whether that be a ponytail or messy bun, these accouterments can add something unique to any cut. Braids, braids, and more braids are sweeping the runways and magazine layouts. Try on a fishtail braid that’s loose with lots of sultry sprigs of hair flowing along your face. You can add twists to shorter cuts like bobs and lobs by adding a few hair extensions to your natural cut. Be sure to buy extensions made from human hair and match to your current hair color. Speaking of color, neon dyes is grabbing attention both under the fluorescent lights. Be prepared to have everyone asking you where you got your hair done! Fiery reds, Electric Blues, and purples are what everyone is raving about for 2016 and most likely will carry past the New Year. Imagine how crazy beautiful your French twist will be once you add some of these ultra-funky and fresh colors that glow in the black lights. Next, decide with your bun if you’re going to go low with a flow or up high on top of your head. 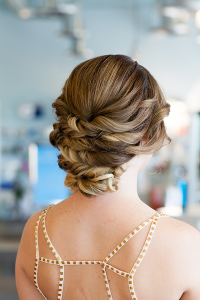 Incorporate braids with buns and you’ve got a whole lot more fun. One theme is definitive across the board with any of these styles, and that’s fine flowing curls and waves. Be sure to make it the hair look fluid. Bangs are always a nice way to change up any cut. With a chunky short bang that frames the face, you’re updo takes on a whole new design. Keep some sprigs pulled around the face to show off your eyes. Wispy pieces of hair also avoid the tightly coiffed locks from last year. With a little ingenuity and imagination, you’re be turning your holiday glam into Salon Sora Glamour! Stay charming!